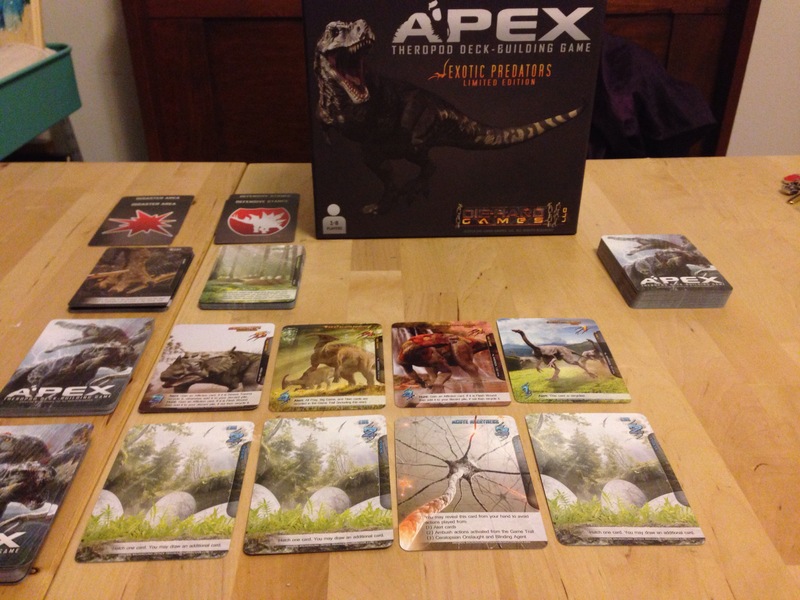 Rob: Today we’re going to learn about why it wouldn’t be as cool as you might think to go back in time and see the dinosaurs with Apex: Theropod Deck-Building Game, from Die-Hard Games and designer Herschel Hoffmeyer. The short version is that everything either wants to kill you and eat you, or just kill you. Kind of like Australia only with smaller carnivores. I’m kidding about Australia, but still, carnivorous dinosaurs don’t mess around. And the sheer brutality of Apex (both in its illustrations and in its difficulty) goes to great lengths to get this point across. So I guess the question is, are you a bad enough dino to rescue the president’s become the apex predator? Andrew: That ‘bad enough dude’ joke is a dinosaur, too. Rob: Your face is a dinosaur. Andrew: Oh man, that would be so cool. Seriously, who wouldn’t want a face like that? Apex does share several similarities with other deck building games, so if you’re familiar with the basics you’ve probably got an idea of what to expect here, but it does change things up quite a bit. While the main goal is still to use your cards to generate points to kill stuff and points to acquire more powerful cards, there’s an interesting interplay between both. 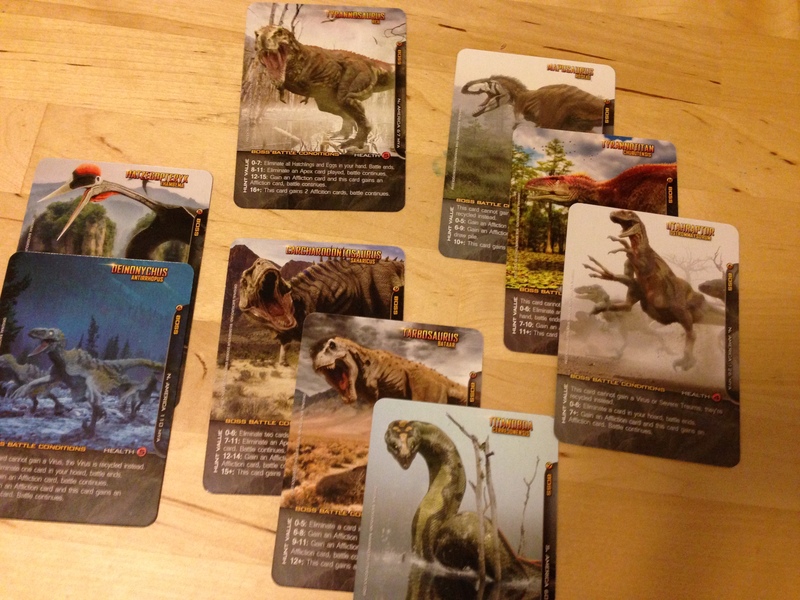 If you want to “buy” anything (new dinosaur cards, special ability cards, etc), you’re going to need Evolve points. The most immediate way for you to gain these points is to use the handful of carcass cards you’ll start with, but because there are only so many rounds before the game ends you’ll want to move a bit faster than that. And that will require hunting. That’s a whole lot of cards. Foam inserts not included, but recommended. Many of the cards you’ll have access to generate what are called Hunt points, which can be combined in order to kill creatures of equal or lesser value. There’s also a neat little push-your-luck mechanic where you can place cards aside for an Ambush, but will have to draw an Alert card that could end up ruining your trap as well as probably making a lot of the prey in the Game Trail far more dangerous. When you successfully hunt something, it gets added to your Hoard, where you can basically stockpile bodies until you decide to “eat” them and use their Evolve points to acquire more cards. What ties all this together is that you can’t split the value of a single card when hunting or evolving. You can combine card values, though. In other words, if you have a card with a Hunt value of 4 and there are two creatures in the Game Trail with a value of 1, you can’t hunt both with the same card. Ditto for evolving, only with spending points. So it’s actually very important to figure out how to hunt and evolve as efficiently as possible. I hate this event card so, so much. Of course as all of this is going on, event cards will change from round to round and generally make things more difficult for everybody. Nobody said being a dinosaur was easy, right? Right. And Apex is brutal. The environment will mess you up, bosses always seem to have the upper hand, and sometimes an unfortunate draw could completely torpedo your plans a the Game Trail empties and your carefully planed ambush goes to waste. There’s also a figurative ton of variability to Apex, with 600 cards available from the get go. Unfortunately they’re not pre-sorted, so you’ll have to dig in and separate out the different starter decks and such, but it’s nowhere near as bad as Legendary Encounters in this regard. I’m not a fan of the cardboard inserts, though. They make it difficult to remove cards from the box and aren’t particularly sturdy. I ended up replacing them with some extra foam inserts I had laying around form other deck builders. These are all the different bosses available, and each one comes with several minions. They’re all jerks. 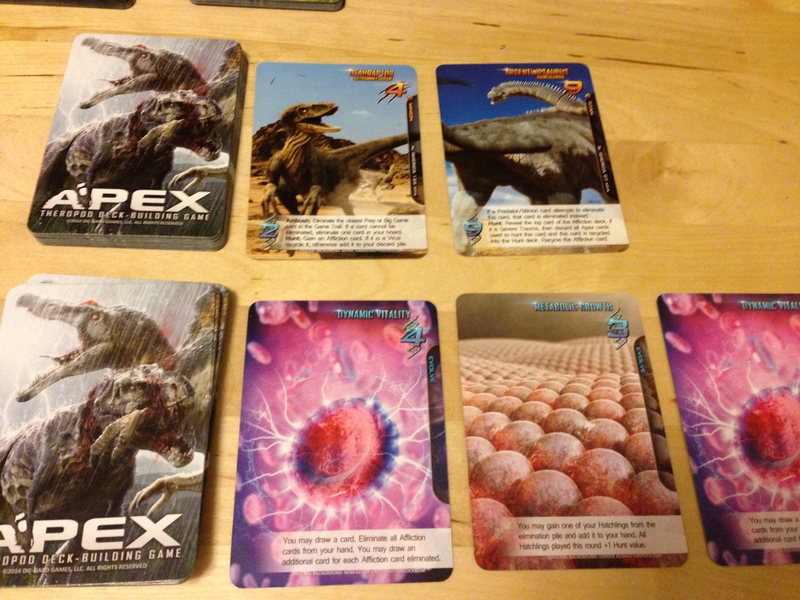 Then there are the individual Apex decks for all the different playable dinosaurs (9 in my copy because I managed to snag the Exotic Predators edition). I’ve only had the opportunity to mess around with a few of them so far, but I can already tell that there’s a fair bit of difference in how you need to play them. For example, the Carnotaurus is a sort of jack of all trades, able to turn injuries into an advantage and can set up small ambushes without much trouble. The Sarcosuchus, however, is almost entirely about ambush tactics and can actually alter the Game Trail by placing its own cards into the Hunt deck. 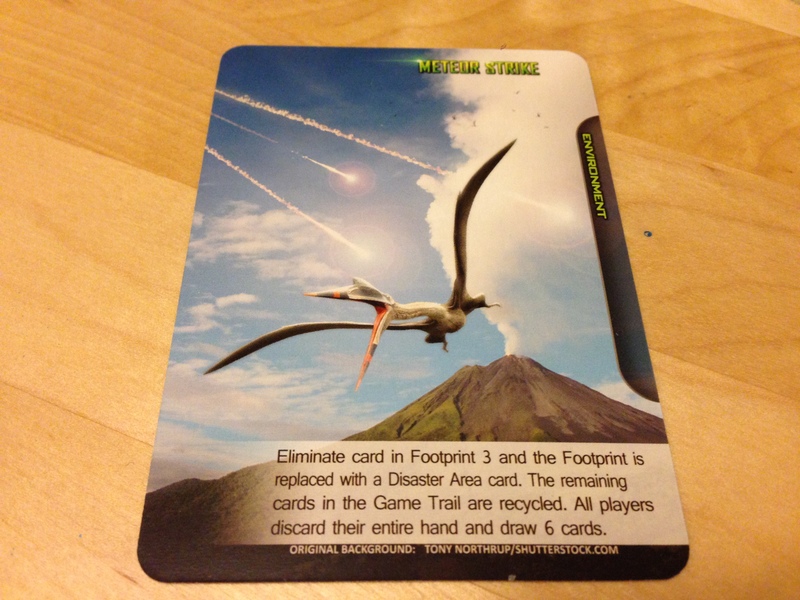 Then there’s the Velociraptor, which is all about pack hunting and has several cards that will pull reinforcements from the discard pile. I will say though, that while I obviously really like Apex (at least I think it should be obvious by now), the rules aren’t structured or worded very clearly and can be a bit of a pain to suss out. I had to reread several passages multiple times, refer to message boards, and of course keep the rulebook handy while playing. I’m still not 100% on how turn order and round resets work. What we have here is a rather sparse Game Trail and a full Evolution pool. Player interaction is practically nonexistent as well. 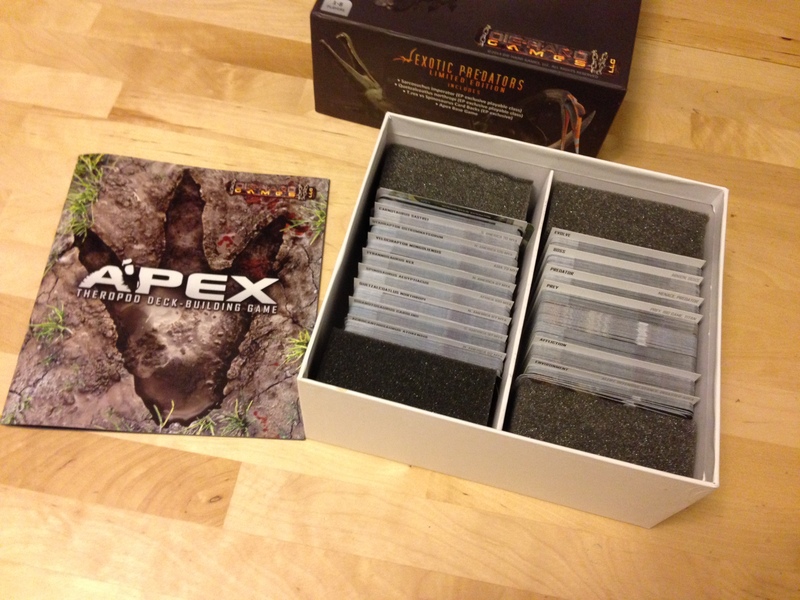 Normally, that sort of thing doesn’t bother me as I tend to prefer cooperative or indirectly competitive games, but the entire point of Apex is to be the dominant predator and you really can’t do much of anything to affect anyone else aside from hunting what they wanted to hunt or evolving what they wanted to evolve. Everyone just sort of does their own thing until the game ends. And there’s not much going on when it’s not your turn, so downtime isn’t particularly exciting either. 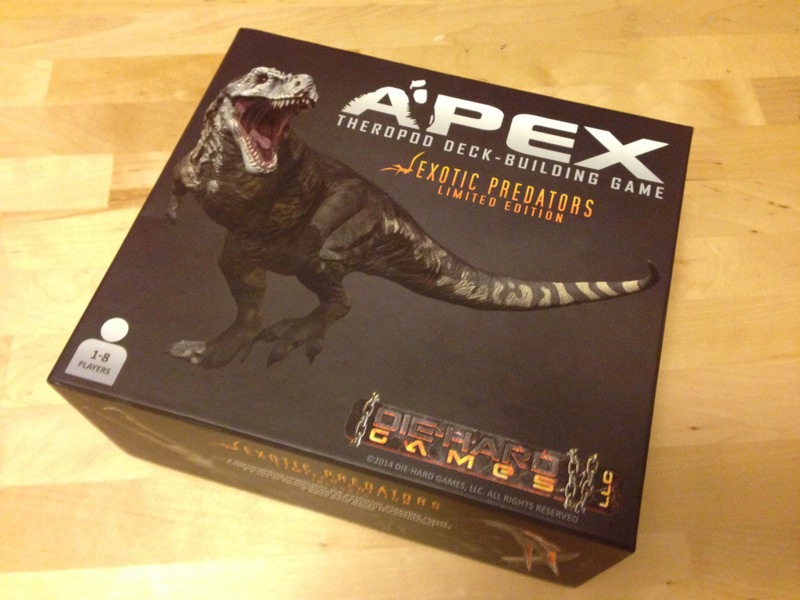 Apex can be a bit of a beast to figure out at first, but after a few playthroughs and maybe a glance over at Board Game Geek it’ll become a lot more manageable. The important thing is that, despite a bit of multiplayer drag, it can be quite a lot of fun. Solitaire is seriously no joke. If you can’t kill the boss before Extinction, you lose. Believe it or not, I think Apex is actually much, much better for solo than it is for multiplayer. It’s a lot easier to stay engaged when you don’t have to wait for everybody to take their turns, and even though the Game Trail might be smaller with fewer people it can still be a challenge. Actually it might even be a little more difficult because the trail isn’t getting cycled through quite as much and you’re more likely to run into more aggressive creatures. Expansions are in the works, but the designer is keeping pretty tight-lipped as to what we can expect from them – supposedly there are plans to allow players to hunt each other, or something to that effect. Fingers crossed it turns out to be true. Oh! And aquatic predators! I wanna play as a Megalodon! Next Post:Celebrate TableTop Day With a New Promo Djinn Card for Five Tribes!